← thirty-two things i’ve learned about being a mama. two pounds of almonds. endless possibilities. I use a lot of almonds. I mean a lot. Living a grain free lifestyle, and loving to bake, means I use almond flour regularly for baking. I use almond milk instead of cows milk for our whole family. And instead of peanut butter we all use almond butter. So, as you can see, almonds are a daily use item around our house. The problem is, almonds can be a fairly expensive habit to support. I will not pay anywhere from eight to fifteen dollars for a jar of almond butter ever again. I will not buy cartons of almond milk that have added unnecessary ingredients. But I will keep my almond habit. Every week I buy two pounds of raw almonds from Trader Joe’s. They cost $6.99 per pound which is not too shabby, but you may be able to find them even cheaper by the pound elsewhere. Look around! What do I do with two pounds of almonds every single week? I’m so glad you asked. I make a jar of almond butter. 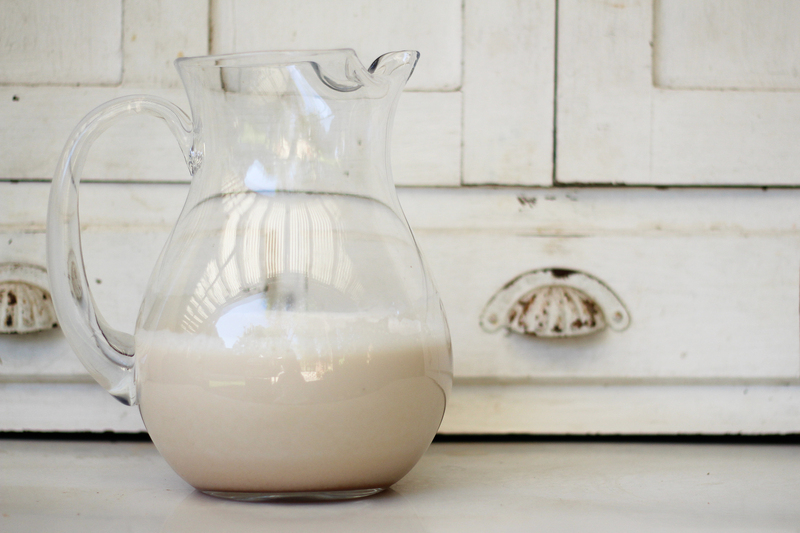 I make a jug of almond milk. I use the pulp left over from making almond milk and I turn it into almond meal. Not only am I now spending fourteen dollars a week on products that used to cost me twenty dollars a week, I am also completely in control of what does and does not go into my food. There are no unnecessary ingredients, it all tastes fantastic and it is super simple. Let’s start with almond butter. You will need a food processor for this recipe. If you don’t have a food processor it is a wonderful investment to make. I use mine almost daily and I’m pretty sure you will too. 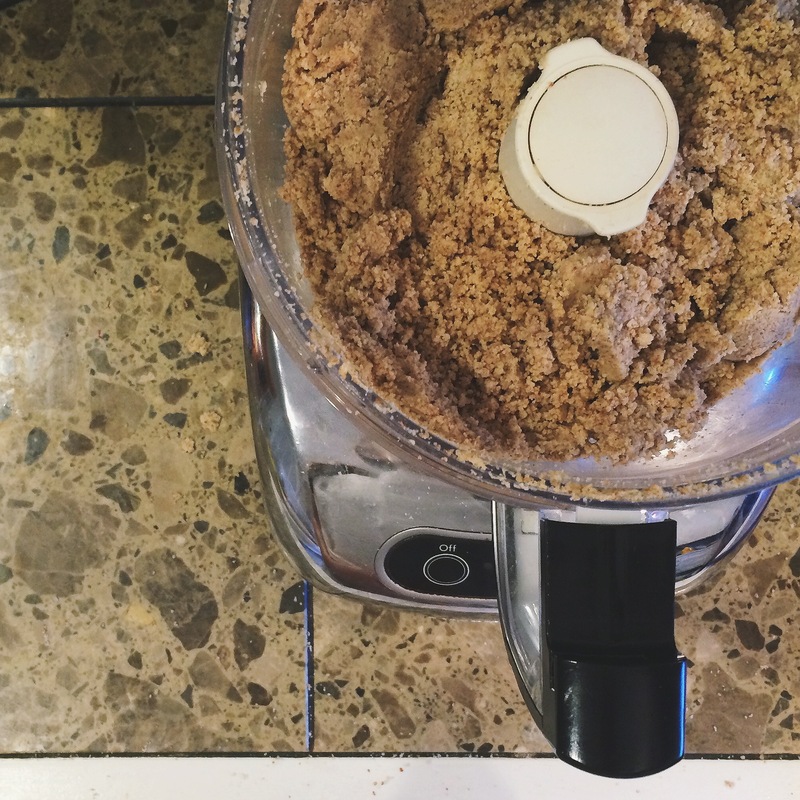 Another thing you will need to make almond butter is a decent dose of patience. The process is simple, but tedious and will take a while. At some point you will be positive that your almonds will never become butter. But they always do eventually and it’s worth it.This is what it looks like when I’m ready to give up every single time. But keep going, there is hope! See how beautiful hope is? *some people choose to add a sweetener such as honey or maple syrup to their almond butter. I find that the cinnamon adds a nice sweet touch without adding an actual sugar but it is also delicious with a tablespoon or two of your favorite sweetener. 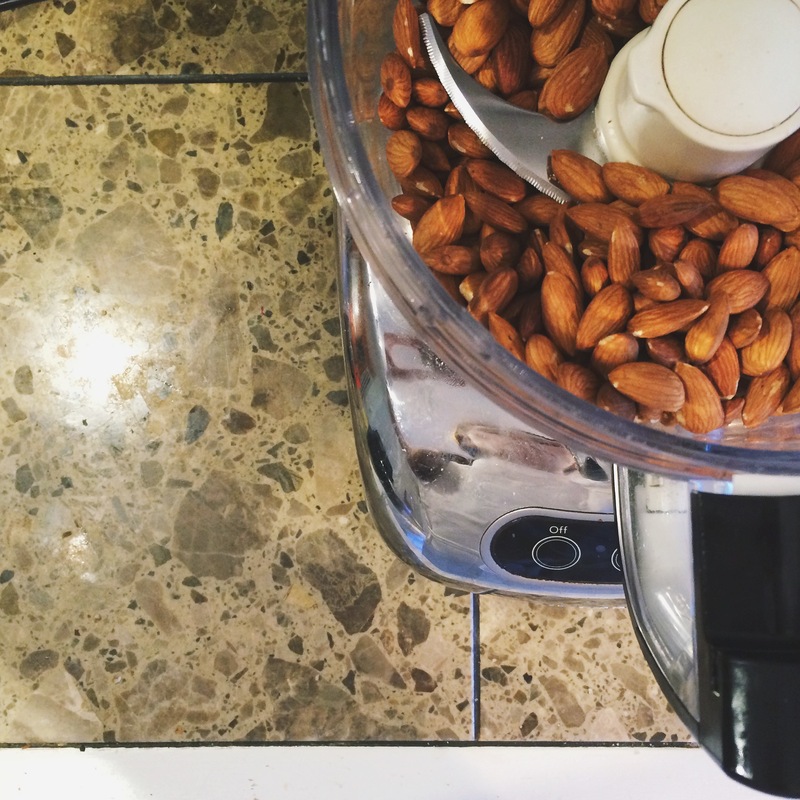 Pour almonds into food processor and process away. When almonds get pushed against the side of the food processor, stop the processor and use a spatula to scrape the almond pieces off the sides. You will have to do this quite often for the first several minutes. Repeat this step until your almonds become almost almond butter. Add cinnamon and sea salt and coconut oil if desired (the coconut oil helps speed up the process, and cinnamon and sea salt are just delightful, but you can make almond butter with simply almonds if you want to). 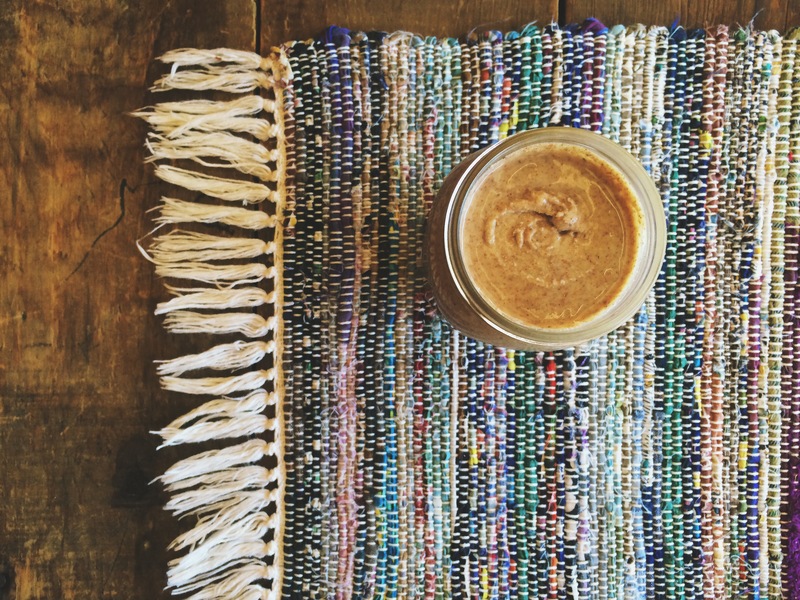 Blend until your almond butter is the perfect consistency and then store in an airtight container. Or eat it all in one sitting with apples or bananas or my favorite almond date milkshake recipe which I’ll share at the end of this post. Now that was pretty easy, but almond milk is about ten times easier. For making almond milk you will need a nut milk bag which you can order online or find at some local health food stores. I ordered mine here, it is currently on sale for only $8.99. 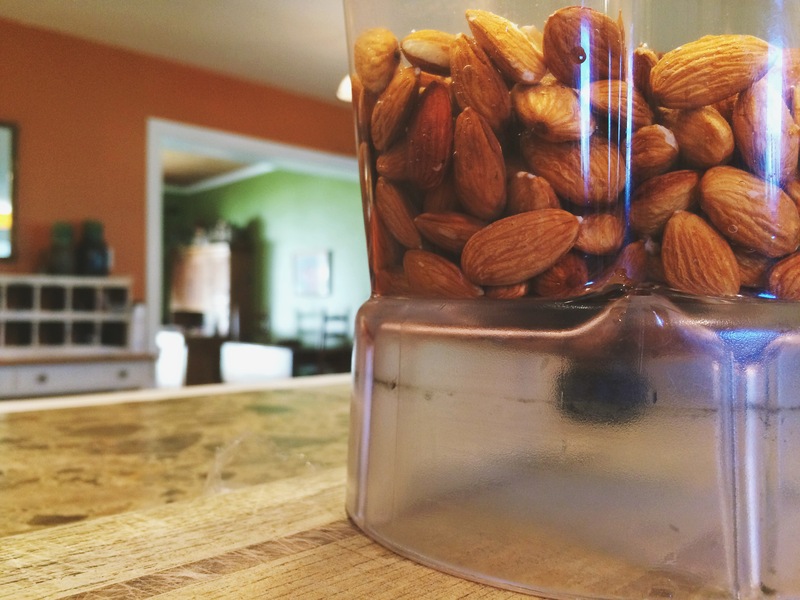 two cups of raw almonds (many people choose to soak their almonds overnight, there are lots of articles you can read about why this is a good idea. It is not necessary for making the almond milk but if you find you have a hard time digesting nuts, soaking them will help! Put all on the ingredients into a blender. Blend the mixture on high for approximately thirty seconds. 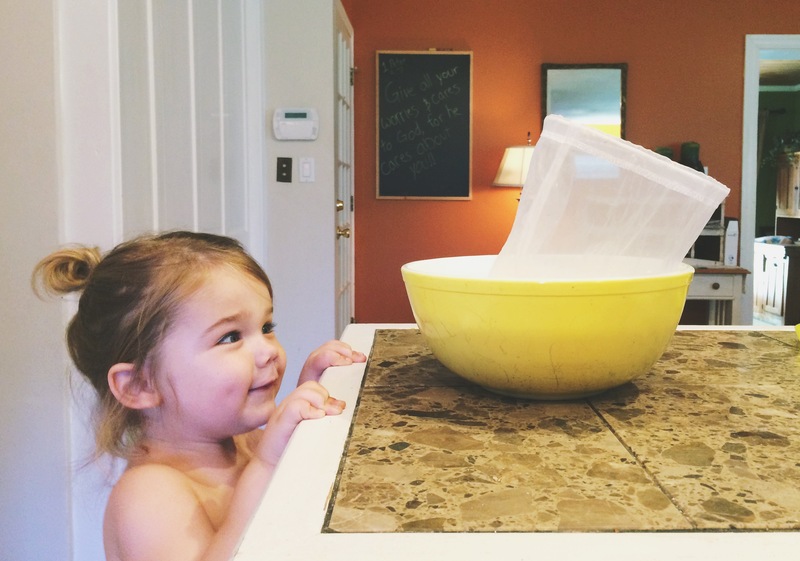 Place your milk bag in a large mixing bowl (as seen in the photo above of Hudson staring lovingly at a large yellow bowl) and slowly pour the contents of the blender into the bag. Tighten the draw string on the milk bag and squeeze all of the almond milk into the mixing bowl. When you think you have all of the liquid out of the pulp, squeeze it one more time just to be sure. Set your milk bag, which is now filled with almond pulp, to the side and pour your almond milk into a pitcher or milk jar or directly into your mouth. Whatever works. 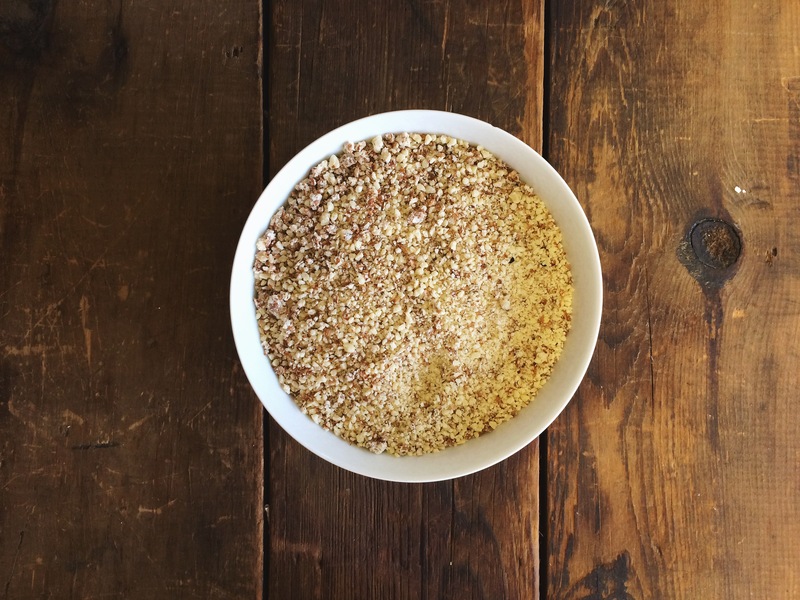 Now you want to grab your milk bag filled with almond pulp and make some almond meal. Simply spread your almond pulp out in a thin layer on a non stick baking sheet, or a baking sheet lined with parchment paper. Now toss it into an oven preheated to 170 degrees fahrenheit. You want to bake this at a low temperature, for two hours, to remove any excess moisture left in the pulp. Be sure to stir every thirty minutes, and two hours later you will have almond meal. Now bake whatever you’re craving! For the record, almond meal made from almond pulp is not quite as fine as almond meal or flour from the store, so it does slightly change the consistency of your baked goods. I use it primarily to make the almond meal biscuits that we use for sandwiches. If I’m baking cookies or a cake I use my emergency bag of Trader Joe’s almond meal. But next time I make almond meal I am planning to try blending the dried out meal in the food processor for a few seconds so it is more fine, and then I’ll try baking a dessert with it. I’ll let you know how it goes! Now that you know most of my almond tricks, you need to know the most important one. 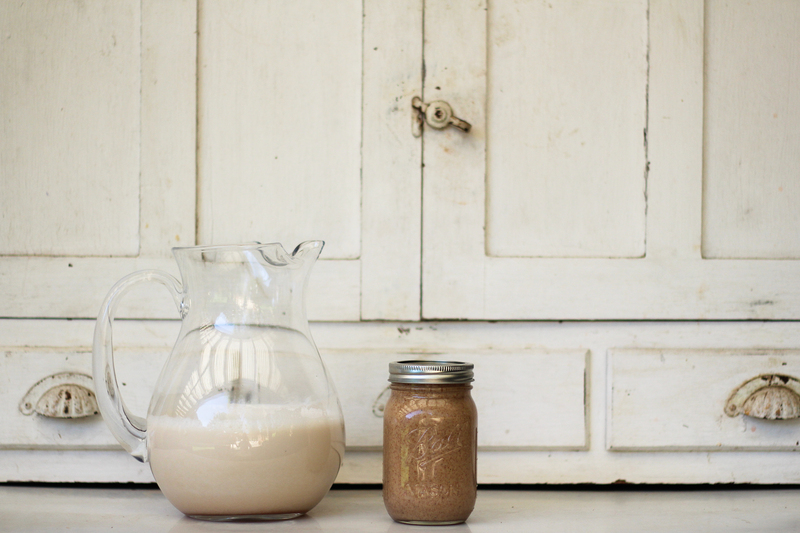 Using the almond milk and the almond butter that you just made, you MUST make my favorite milkshake of all time. I found the inspiration for it here and only made simple modifications. I am not ashamed to tell you I eat this almost every single day. Blend until you have a thick creamy consistency. Eat it right away and then make another one because you know you want to. So there are all of the ways I use and enjoy almonds. I’m addicted and I’m okay with it. Now go buy some almonds! And tag your almond goodness to #thecrunchyconfessional so I can see how it went!